Fresh, light, healthy yet still traditional, this Woody’s™ Gammon recipe has it all. The complementary apple slaw adds a crisp, clean dimension to the gammon and the grilled nectarines a touch of sweetness. Make this an alternative to a cooked Christmas dinner and serve for Christmas lunch – so light and delicious you will want two portions… it is Christmas after all! Take the thick top layer of skin off the Gammon and score the fat in a criss-cross effect to form diamond shapes. Stud every second diamond shape with clove and place in a roasting pan that is suitable for oven cooking. 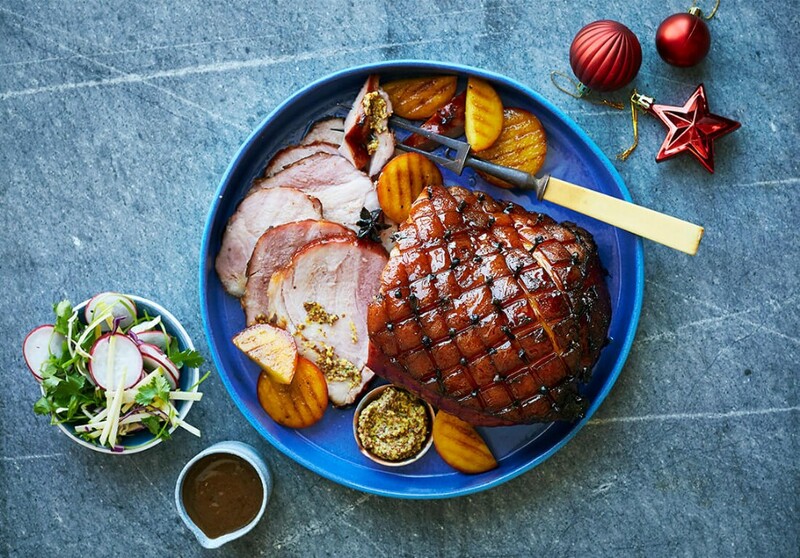 Pour 500ml of Coca-Cola over the gammon, add the Star anise to the base of the roasting pan, cover with tin foil and roast in the oven for an hour. through and combine well. Set aside for later. After an hour of cooking, take the gammon out of the oven, uncover and pour the honey mixture over the fat making sure to cover the whole top of the gammon. Place back in the oven, uncovered for a further 45-60 minutes. Baste the gammon with the juices in the pan until the fat is evenly browned. When the gammon is ready, take out the oven and cover with foil and leave to rest for 20-30minutes before slicing. While the gammon is cooking, make the salad by adding all the salad ingredients together in a bowl and gently toss to JUST mix. Don’t overmix! Set aside until ready to serve. Finish all the meal with grilled nectarines. Halve or slice the cheeks of the nectarines and toss with the olive oil. Using a smoking hot griddle pan, place the nectarines flesh side down and griddle until charred. To serve, slice into generous portions, serve with grilled nectarines and fresh apple slaw. Add wholegrain mustard as a bonus!